Team Scary Potter and the Hauntwarts Express reviewed this attraction on October 22, 2016. Dark View is a rare breed of haunted attraction, fusing an old-school design and mentality to a new form of creepy interactive theater. A trip to Dark View isn’t a procession through dark halls with swarms of half-bored haunters booing you toward your next destination. 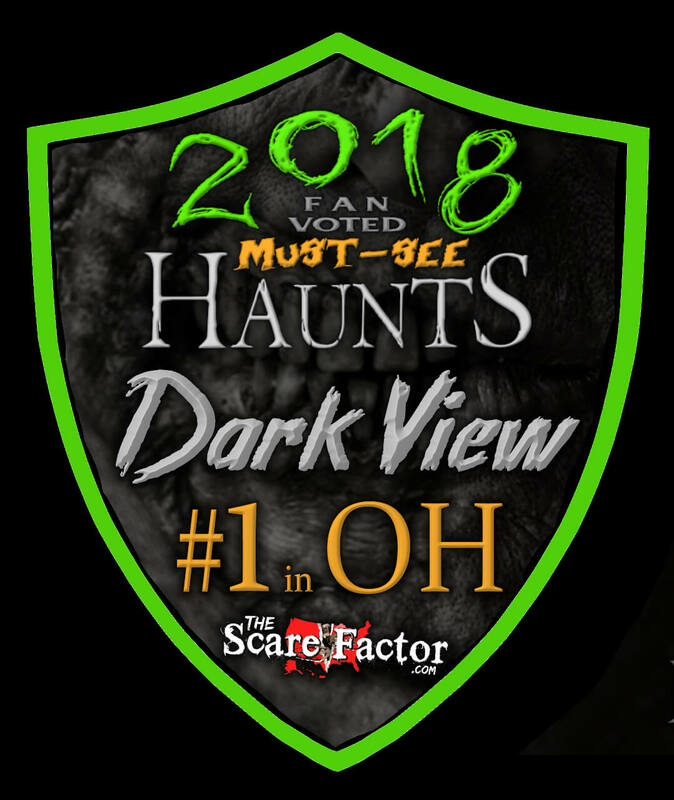 No, it’s a collection of sometimes-humorous, sometimes-harrowing encounters with uniquely twisted haunted personalities, fully engaging you not as a spectator, but a volunteer in the experience! 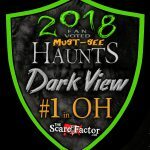 Go beyond the boo, and head to Toronto, Ohio this haunted season to take part in the fun. Dark View’s cast is comprised entirely of volunteers – 60 or 70 of them overall. Honestly, when we were informed of this after our walkthrough, we were shocked. Large sections of Dark View are semi-guided and even the portions that aren’t still involve long, drawn-out interactions with cast members… and that was, without question, Dark View’s strongest element. These “talkie” characters that we encountered ranged from pretty good to fantastic with an absurd percentage falling on the latter portion of the spectrum. Their dispositions varied – some helpful, others threatening, but all were impressively successful at the most important factor of any haunted attraction : they were entertaining. From the very eccentric, paranormal, investigative gal to the playful, surprisingly good-natured butcher, the benevolent figures we met in our travels were bemusingly charming in their own idiosyncratic ways (though we’re still waiting on that cake, Mr. Butcher!). Meanwhile, the more sinister forces, including the psychologically-pendulum-like Jack/Sally and the very hungry Mother, exuded atypically-compelling creepiness while still maintaining an underlying good-naturedness that made the characterizations more appealing than if they had just screamed in our faces and brooded after us. That is something that we liked very much : of all of the unique characters we met at Dark View, none pushed the envelope too far as to pass through entertaining into obnoxiousness. I believe fellow haunt-goers will understand what I mean with this. Dark View has a great collective heart and it shined through each performance that we saw. To put a finer point on it : the cast really made the attraction – and they made it great. To insert one more shout-out here : as one of the most subtly-but-genuinely creepy characters that we’ve seen so far, there’s Luke. Luke didn’t need a mask or even really any makeup to be scary – just a propeller-quick assemblage of vaguely-threatening and off-color anecdotes and a big smile that said “Yeah, I may ACTUALLY eat you.” I’ll be honest, I’m not convinced he was even acting. Most character enhancements were attained through make-upping with only a few masks needed. This made each character feel unique, less a “that’s a scarecrow; oh, there’s another Jason” and more “Jack/Sally, huh? That guy will DEFINITELY put me back into therapy.” Costuming work wasn’t overly complex, but it was efficient and effective – more about maintaining atmosphere than attempting to wow with eye-candy. One stand-out though, was the doll-monster in the estate. The actor/ress portraying the character did a great job, but the fantastic costume really made the scare work. Though it was easy enough to find Dark View via GPS, we didn’t really see any signs or indications until we were right on top of the location. Once there, though, there were plenty of signs and flashing lights to let us know that we were definitely in the right place, and several parking spotters to lead us to an open space. They had some of the cleanest portable toilets that I’ve ever seen. I believe that we can all quietly agree to the importance of that and move on. When we entered the main hub area, we were greeted by Jim, who was acting as MC for the attraction, entertaining and informing patrons as they waited for their numbers to be called – Dark View uses a version of a timed ticketing system. Purchased tickets are numbered and a handful are called at a time to wait in line for the main attraction. Customers who have not been called into line yet are free to persue the many offerings of the hub location – concessions, souvenirs, an escape, a Last Ride attraction, a movie screen and several fires. Of the concessions, I am compelled to warn you – the homemade brownies are incredible. Our team accounted for perhaps half of the available supply the night we visited and may have continued partaking had we not run them dry. No empty superlatives here : they deserve all available praises. Paired with their tasty hot chocolate, the combination is not to be missed by any attending parties. The escape room was a happy surprise. At 25 minutes, it was something of a ‘tweener – an intermediary experience between the more standard hour-long affairs and the recent trend of haunted attractions to assemble 5 minute micro-rooms. We really enjoyed this library-inspired experience. The puzzles leaned heavier on the brain teaser/riddle side than the sometimes frustrating “dig through everything that isn’t nailed down” maxim of many similar attractions. The room was put together well, with just enough clutter and noise to be challenging, but not distracting. The puzzles were fair, as was the amount of time provided to complete them. This was one of our favorite escape rooms of the year. Though we were unsuccessful, groups that are able to free themselves win t-shirts. Line/hub entertainment is handled primarily by several transient monsters, though the night of our arrival, most of these were unavailable. One sad scarecrow remained; he almost seemed omnipresent : every time we disengaged from conversation, there he was, a short distance away, entertaining a group of kids or methodically plodding toward a target. Additionally, Jim and other random characters would engage in colorful, in-character conversations spontaneously across the hub. Dark View did a FANTASTIC job of spacing out groups and we never bumped into any other non-monsters. This is always greatly appreciated. The attraction begins at the Goucher Farmhouse, the facade of which was wonderfully designed. With small animatronic subtleties shifting around every few minutes and thunder and lightning effects spliced in for additional ambience, the farmhouse is eerily foreboding. That the entire location is tucked away in an isolated, unpopulated segment of countryside amplifies that sensation of dread. The crowning cherry, though : as we stood in line amongst these heightened elements of foreshadowing, the first plucked banjo notes began. As any student of the haunted arts knows, banjos ALWAYS forewarn impending troubles. The farmhouse had the best set design of all of the segments by far. It was well-constructed and believable. The graveyard was, honestly, pretty sparse and seemed a bit like an afterthought in comparison to the other portions of the attraction. The back half of the trail wasn’t particularly over-populated with props and set design either, but it really didn’t need it. The maze was surprisingly tricky and elaborate, with many hidden off-shoots and extra corridors, and got us spun around and lost on multiple occasions. There weren’t a vast number of special effects at play, but several of them were particularly effective. The elevator/bridge section of the haunt was one of our favorites, enhanced by a charismatic actor helming them. In the farmhouse, the ouija scene was memorable – clever and uniquely staged and the frequent rattling of objects (particularly in the “hallway of doors”) throughout the entire house helped established an unsettled, chilling momentum. The attraction is split into 5 separate sections. There isn’t really a linking theme or narrative beyond the farmhouse – mostly a collection of brief, haunted vignettes. We deduced very quickly that Dark View was not going to be an exquisitely-terrifying experience. That isn’t what they aimed to be and it showed. There were only a handful of “startle”-based actors and their attempts were definitely weak and largely routine. The longer, interactive actors were much more effective – some were playfully creepy, others intensely brooding or explosively visceral. Because most of the scares played out like horror-scenes, our entire group was able to become involved in most of them, evenly distributing entertainment (be it fear-based or otherwise) to everyone. This kept the whole team feeling involved and attentive throughout the attraction. Our conversation with “Mother” yielded the most unexpected shock – a perfectly-timed distraction scare that sprung a few reviewers from their feet. But, the creepiest overall interaction definitely occurred in the cabin. Now, while it’s true that “what happens in the cabin, stays in the cabin,” I will say that the realism of that experience, as portrayed by the actor involved, is what really elevated the scene (and our heart rates). My favorite scare, though, involved a turncoat from our own number. Special thanks to the scarecrow in the maze for making that one happen. No one can terrify you quite like your friends, right? It was around 40 minutes for us to fully explore the Dark View attraction and tickets cost $18 (or $25 for VIP passes), meaning that we received 2.22 minutes of entertainment per dollar spent, which is a good bit above average. Dark View wasn’t the scariest attraction we visited this year, but it was one of the most fun. Their actors were excellent at something that I think is quintessential of interactive attractions – they acted beyond the script, able to ad-lib and play along with anything we hit them with. So many times when we go through haunted attractions, it feels like the actors may as well be animatronics, able to function only within the limited coding of their programming. Dark View’s cast excelled at transcending these limitations and the experience was immensely more rewarding because of it. We had a great time and really appreciated all of the great performances that we experienced. We highly recommend visiting Dark View this season. *Dark View also has an escape room, this season it was themed The Library.